Be the first to share your favorite memory, photo or story of Shella. This memorial page is dedicated for family, friends and future generations to celebrate the life of their loved one. 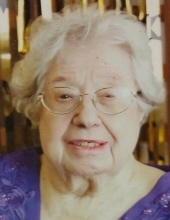 Shella Marie Hodge, age 94, of Knoxville passed away Saturday evening, November 24, 2018 at Shannondale Health Care Center. Shella was born in Marshall, North Carolina to Curliss Norton and Bessie Crawford Norton. In addition to her parents she is preceded in death by her brothers, Carl, Spurgeon and Carson Norton. Shella is survived by her son and daughter-in-law, Jimmy and Elaine Hodge; grandsons, Steven Hodge and wife Sonya all of Knoxville, Michael Hodge and wife Amanda of Estero, Florida; great grandchildren, Jacob, Savannah, Elizabeth and Matthew, Madeleine and Lucas; sisters, Lorena Norman, Hope Muse; several nieces and nephews. Graveside services and interment will be held at Sherwood Memorial Gardens. To send flowers or a remembrance gift to the family of Shella Marie Hodge, please visit our Tribute Store. "Email Address" would like to share the life celebration of Shella Marie Hodge. Click on the "link" to go to share a favorite memory or leave a condolence message for the family.